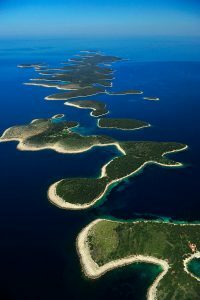 Croatia is blessed with having over 1000 islands spanning its long coastline, each with its own story waiting to be uncovered. With a playground of pristine islands as a backyard, a visit to coastal Croatia cannot be complete without a game of island hopping. 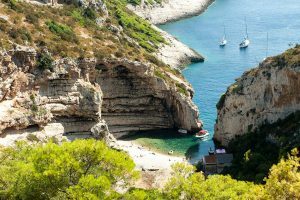 With so many islands to choose from, it can be difficult to decide where to start your island hopping adventures so Šugaman Tours have created a handy one-day speedboat excursion where you can tick five islands off in one day. 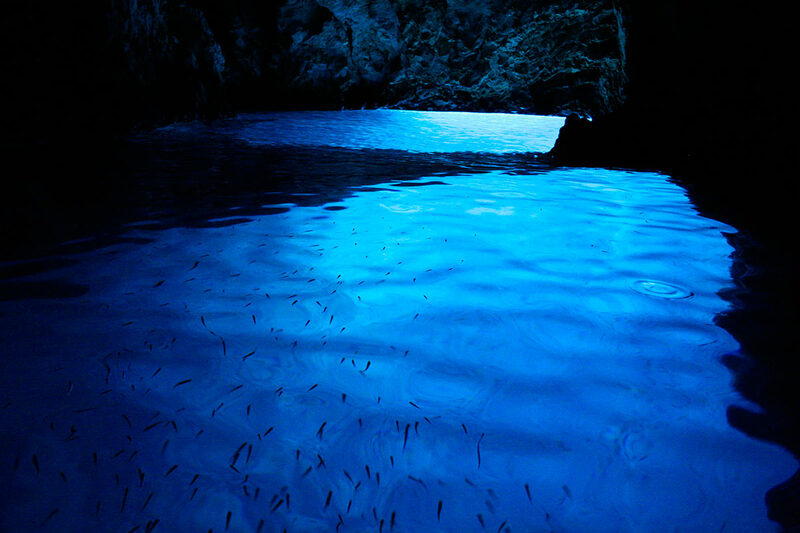 Starting from Split, the signature Blue Cave and Hvar Tour takes you to five different islands; Blue Cave on Biševo Island, Stiniva Cove on Vis Island, Green Cave on Ravnik Island, Budikovac Island, Palmižana on Pakleni Islands, and Hvar Town on Hvar Island. Let’s explore them today! Beyond the shores of big brother Vis is Biševo, a jagged little island with a population of just 15 that is home to the spectacular Blue Cave, attracting 10,000 visitors every summer. 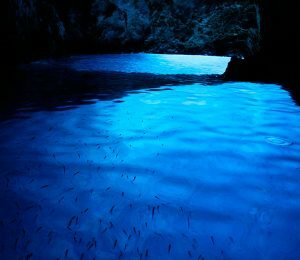 The Blue Cave is a masterpiece made by nature famous for the bright blue light that is created from the sun’s reflection on the seabed. 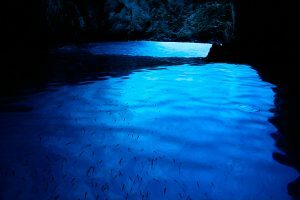 This amazing natural phenomenon occurs only between 10am and 1pm when the sunbeams pierce through the underwater crevices, giving the cave a turquoise light and the water a glittering glow. 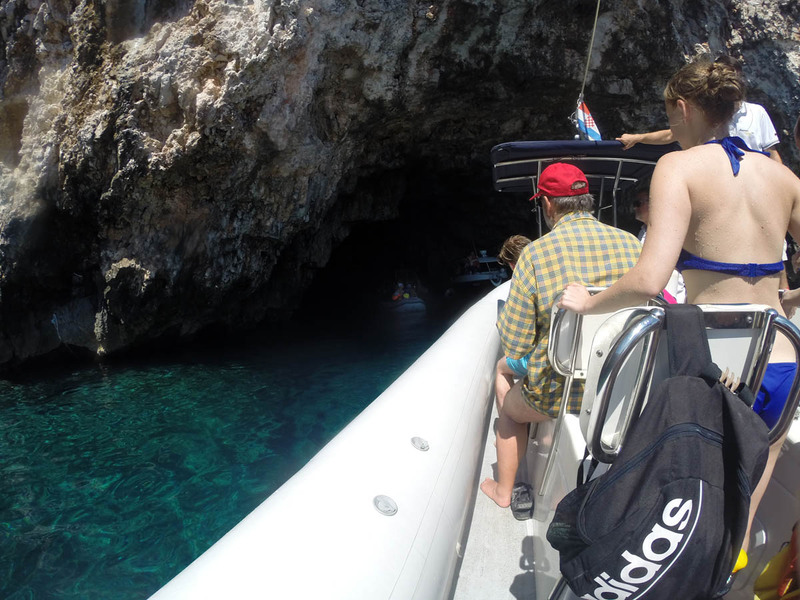 You can only reach the cave by boat through a 2.5m wide and 1.5m high opening along the steep shores of Biševo. Vis Island is certainly one of the most remarkable inhabited islands in the Adriatic, untouched by modern development and tourism due to its former status as a military base, which kept the island isolated for five decades. Along Vis’ rugged coastline is a collection of quaint fishing villages and countless bays only accessible by sea. The Šugaman crew will take you to Stiniva Cove, almost unnoticeable from sea as high vertical cliffs with only a 4m wide opening enclose a long pebble beach. Bask in the midday rays, drink in hand from the beach bar, and just take in the moment as you gaze at the towering cliffs that ring you. Another fascinating find in Vis’ archipelago is Ravnik, a barren island with another illuminated gem; the Green Cave. 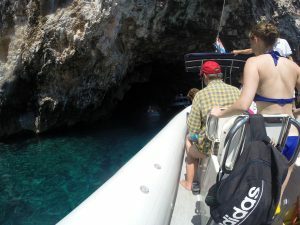 Small boats can access the cave through two openings in the rock face where swimmers can take refuge from the sun as they observe the playful fish on the sandy seabed. At high noon, the sunrays penetrate the fissure in the cave’s ceiling, giving the cave a green glow. Next up is Budikovac, known to locals as Budihovac, Croatia’s only known island with one inhabitant. The island has a turquoise lagoon with an extended pebble beach, ideal for a refreshing dip in the crystal clear waters between basking in the sun. After discovering the islands dotting the shores of Vis, it’s time to enjoy Hvar’s backyard, the Pakleni archipelago of 14 enchanting islands. 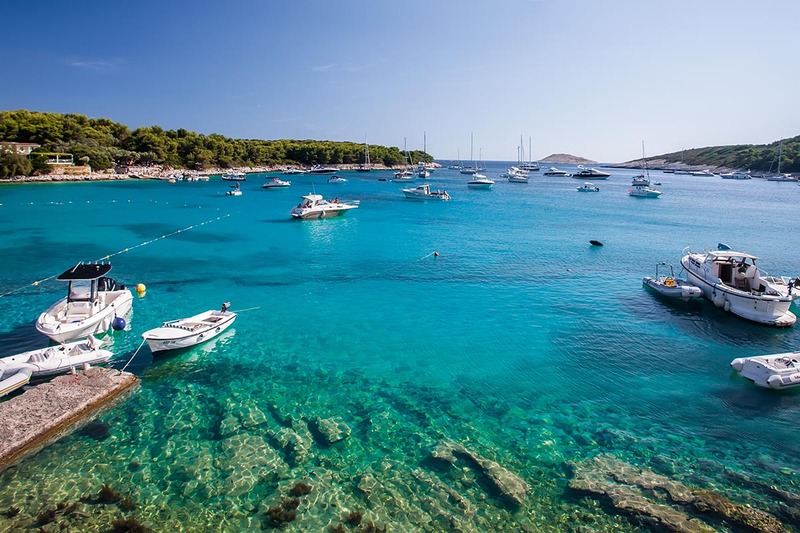 For 2.5 hours, Palmižana Bay on St. Klement Island is yours, a favorite destination among yachtsmen who appreciate the luxury of quiet nights between partying in nearby Hvar. Palmižana Bay is a green haven that has been home to the Meneghello family for centuries. The Meneghellos’ affliction for palm trees means that a botanical sanctuary marks the waterfront and in between floating in the azure Adriatic, you can also stroll through mama Dagmar Meneghello’s art collection. 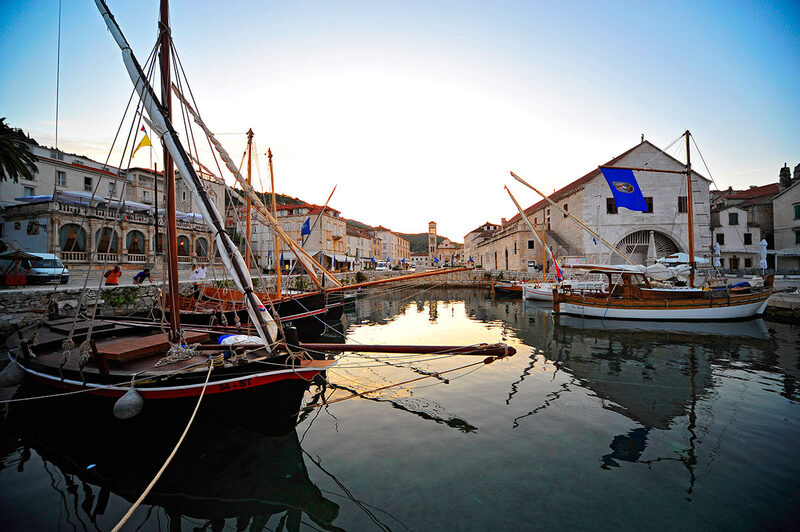 A compulsory pit stop on an island hopping tour in Dalmatia is definitely Hvar Town on the Island of Hvar. Hvar is known to be Croatia’s sunniest island with some 2718 hours of sun per year and with over 120 years of organized tourism under its belt; the destination is a magnet for the rich and famous. Before returning to Split, mingle with the elite on Hvar’s palm-dotted waterfront lined with mega yachts, swanky cocktail bars like Carpe Diem, and the Arsenal, one of the oldest public theatres in Europe. 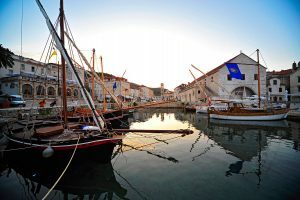 Discover the beauties of Hvar, and wander through the shaded backstreets that has an impressive collection of architecture with an 800-year history; from Venetian palaces and Baroque houses to humble fishermen’s homes and Renaissance residences. At the end of the bay is St. Stephen’s Square, a 4500m2 al fresco living room marked by the ornate Cathedral of St. Stephen and looking over town is the ancient Fortica Fortress wedged into the landscape. As you return to the captivating skyline of Diocletian’s Palace in Split, capture the moment as you reminisce on your day of island hopping in Dalmatia. Five islands and five breathtaking experiences in one day…it can be done.